My Border Collie Irie had the most subtle indication of lameness before she finished growing. She would limp for the blink of an eye and then walk and move perfectly normal. There were times that I wondered if I imagined it. This was my 2nd dog with a “mysterious” ailment. Another BC of mine had some sort of shoulder issue that his adrenaline would mask so well that I was convinced he was sound after studying him like a hawk before deciding to let him exercise. Neither dog had been properly diagnosed (not for lack of trying) and I would give up and just try and rest Irie, put her agility training on hold, and whenever she looked sound for a while, I’d try again. This went on for 5 years of her life until she got up with a more pronounced lameness (walking on 3 legs upon waking (which she walked off!)). It was then that I renewed my efforts to figure out what was going on. In an attempt to locate exactly where she was hurting, I thought I might pinpoint the weakness via targeted fitness exercises. So, I brushed up my knowledge, devoured all the relevant information, took some courses, including an in-depth conditioning program, and, as a result, want to modify what In Joy offers to focus on providing a true physical education. But that’s another story. Meanwhile, I heard of a very experienced vet, who told me that it was so clearly a CCL insufficiency that even his intern could have diagnosed it. What the hell?! I’d seen so many professionals who could not diagnose this over the years! Anyway, I was relieved to finally know what was wrong, though bummed to find out that my best friend needed SERIOUS knee surgery. The most certain way to look at those ligaments is arthroscopically. So, Irie went in to get scoped and, if it proved to be a CCL problem, she’d get the surgery then and there. I regret the decision to do surgery first….If I only knew then what we know now. I knew that a lot of dogs blow out their other side. So, I wondered if it made sense to scope the opposite side while she was under…unless it was too invasive. The surgeon said he’d only scope the other side if I would proceed with surgery for that knee, as well! My mind was blown. I stood in the locker room of the community pool with my toddler, holding the phone and trying to ask all the right questions before deciding to go ahead with TPLO surgery on both knees at the same time!! I had tried to take my kid swimming to take my mind off of my best friend going under the knife. I was such a wreck, forgetting my zip code while trying to fill gas the morning and totally stressed out. This decision has never sat well with me. I was totally freaked out about doing this surgery, because it sounds like a cruel and crazy thing to do. Part of my resistance to the surgery was due to the fact that if you saw my dog move prior to the surgery, you would NOT have been able to tell that she had any problem. Here’s the problem with enthusiastic dogs: they may be very injured but appear fine. After seeing images (scopes) of dogs that were presenting only a suggestion of an injury, often just a little slip here on a turn off an agility jump, or a slight behavior variation, or other subtle indications that most people will complete miss and then dismiss, and seeing that these dogs had destroyed ligaments (often bi-laterally! ), it’s no longer a matter of using typical overt signs of lameness as a measure of soundness. Again, adrenaline and the dog’s desire can completely mask. Allow me to end with a little public service announcement about NOT letting your dog blow out her knees. No more chuck it! Stop letting your dog slip (on stairs, where you could have runners, etc). You can’t prevent all slips, but you definitely can stop a lot of them). Teach your dog to run around something and circle back and run TO you to get the reward. Not only can you present the toy at a safe location (up rather than on the ground, etc), you are building value for running back to you. It takes some training but you’ll be able to get your dog excited about running out to go around a tree (or whatever) with the whole cascade of endorphins without risking the crazy pursuit of the ball (which is so tantalizing when it bounces erratically that it causes a lot of dogs to strain, tear and/ rupture the fibers of their body). If you have a high energy dog that wants to chase, you are almost guaranteed that dog will injure himself chasing things (whether you are aware of it or not). Learn how to play smart and take care with your best friend. 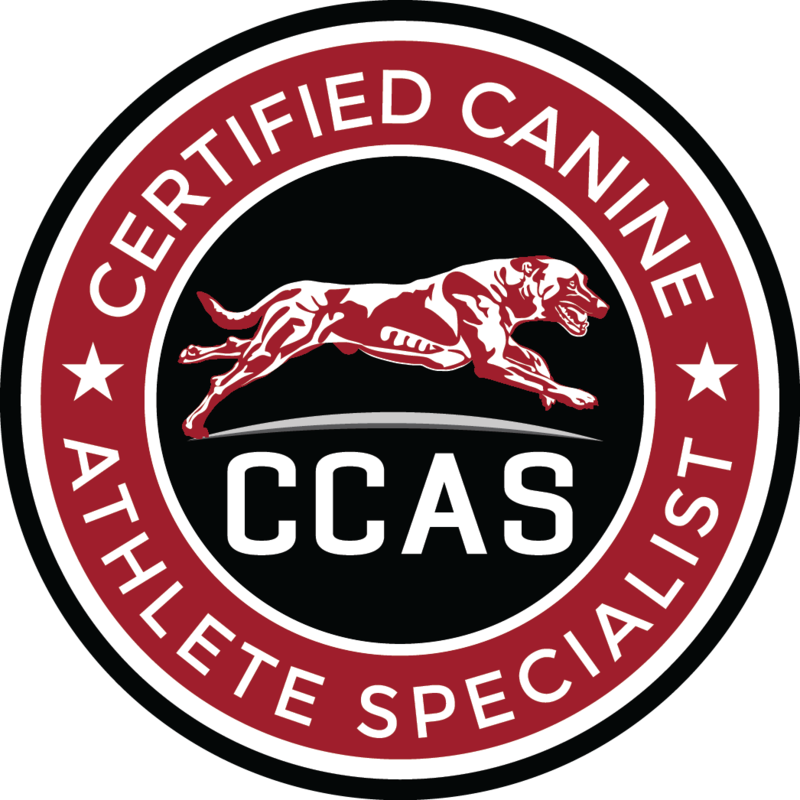 I used to think, “They’re dogs…they’ll be fine.” I looked up to top level trainers who trained bursts of speed and let their dogs fly, and did the same because it was so much fun…until each of those dogs got hurt with difficult soft tissue and ligamental injuries. Dogs are not invincible (regardless of what they think) and, despite the fact that these athletes rip around and seem OK, the truth is that dogs have lots of undiagnosed and underdiagnosed injuries…and these are things that the majority of vets will dismiss! If dogs had a longer life span, their wear and tear would be more obvious. You’re going to have to be your dog’s advocate for health and be smarter than your typical vet. Scar tissue builds up with repeated injuries and the area gets more and more compromised. You need to make the appropriate choices in exercise and play…and get your dog in top condition!